With all the recent revisions to hypertension goals, breast cancer screening, prostate serum antigen (PSA) testing, etc., you’d think medical societies were deliberately trying to confuse medical students and internal medicine residents preparing for the USMLE and ABIM examinations. Fortunately, there isn’t any evidence of any diabolical agenda. At the same time though, because the folks at the ABIM aren’t particularly specific about when to start adopting guidelines (see image below), it’s the responsibility of each exam-taker to be aware of what changes have occurred since we were formally taught a particularly topic in a med school lecture, morning report, or noon conference. Previously, I wrote about the major take-home points from the new JNC8 hypertension guidelines. Around that time, in November 2013, the American College of Cardiology (ACC) and the American Heart Association (AHA) along with the National Heart, Lung, and Blood Institute replaced the previous Adult Treatment Panel (ATP) guidelines on cholesterol management as well. This new set of cholesterol guidelines made headlines worldwide and created a mound of controversy. The debate has died down and major healthcare organizations like Kaiser Permanente have incorporated them into their own guidelines. Thus, we can now establish some key summary points from the guidelines. One of the most profound changes was the removal of the target LDL levels in patients with cardiovascular disease or its equivalents. These individuals are no longer treated to a goal of 100mg/dL, ideally 70mg/dL. 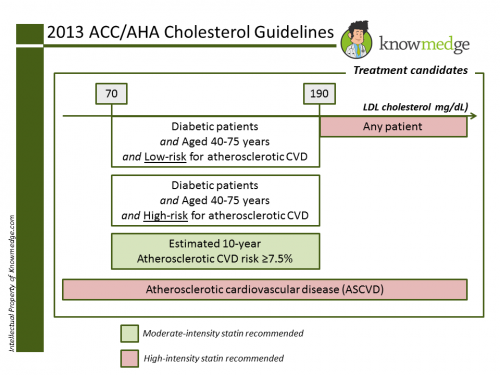 Indeed, no randomized clinical trials has proven benefit of treating to target LDL levels. 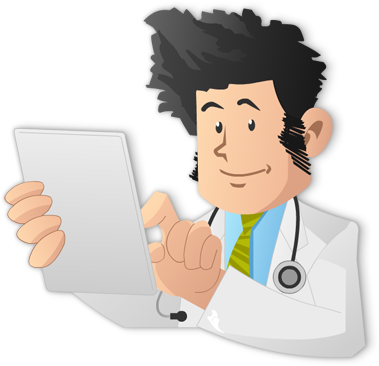 One benefit of this update is that you won’t have to order as many labs on your patients–no more q3 month lipid panels. For patients, this means a reduction in needle sticks and laboratory co-pays while getting the benefit of reduced adverse cardiovascular events. Others may affect the lab values, but statins (HMG-CoA reductase inhibitors) are the only lipid-lowering medications that have been shown to reduce cardiovascular events and mortality in both primary and secondary prevention trials. Non-statin therapies don’t offer any benefit. We could see this coming when ezetemide (Zetia) was found to be ineffective in lowering heart attack or stroke risk despite lowering LDL levels by 15 to 30 percent. Enthusiasm for non-statins was further dampened with the 2011 AIM-HIGH trial. This study of 3414 patients with stable coronary artery disease and low HDL levels was prematurely terminated when the adverse event rate (myocardial infarction, ischemic stroke, death from coronary artery disease, acute coronary syndrome hospitalization and revascularization) was 16.4% in the niacin group and 16.2% in the placebo group. A town in Massachusetts, Framingham is best remembered for the famous study that led to the establishment of cardiac risk factors. The new guidelines replaces this risk calculator with the new Pooled Cohort Risk Assessment, which incorporates ethnicity and gender. The tool calculates risk of fatal and nonfatal stroke in addition to coronary heart disease. The patient’s calculated risk is important because it can determine if the patient receives a low-dose or a high-dose statin. 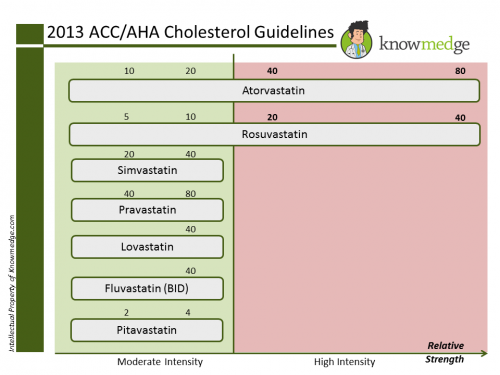 Earlier guidelines didn’t emphasize the strength of the statin. Now we differentiate the medications into moderate- and high-intensity groups. So there you have it. 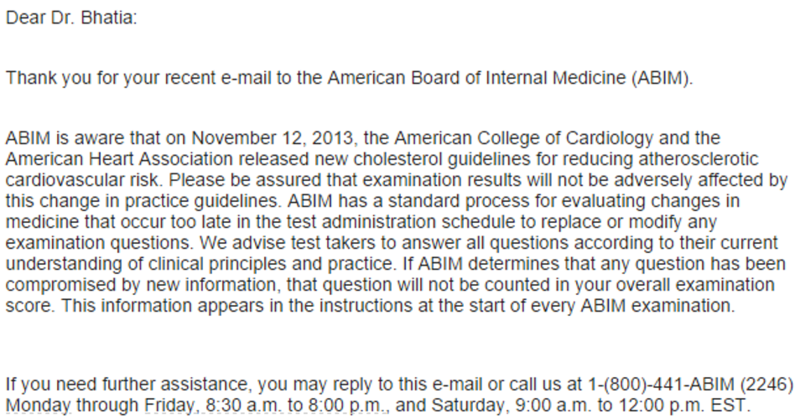 In 5 easy-to-follow bullet points, you have the knowledge you need to answer any question covering the new Cholesterol Guidelines on the ABIM or USMLE exams.